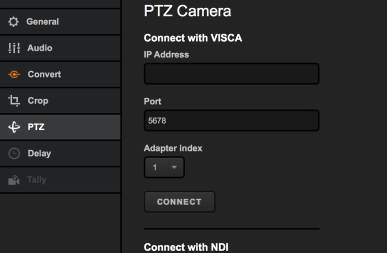 You can connect and control a pan-tilt-zoom (PTZ) camera to Livestream Studio via VISCA or NDI protocols. First, connect your PTZ camera to the same network to which your Studio system is connected. You can then connect the camera to Studio via SDI, HDMI, NDI, RTSP, etc. Go to the Inputs tab and select Add Input. Depending on how you are connecting your camera, your PTZ will appear either under Local Camera (e.g. SDI, HDMI), Remote (NDI), or Stream (RTSP, RTMP). 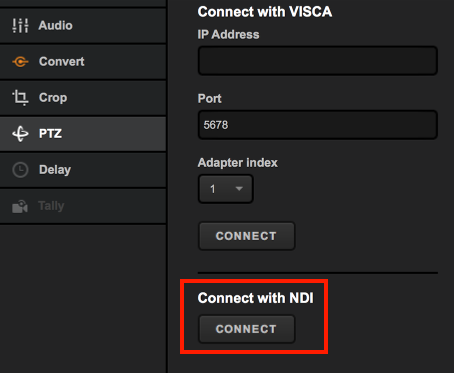 Please note that in order for Studio to receive an NDI camera's signal, you may need to install the NDI|HX Driver from NewTek. 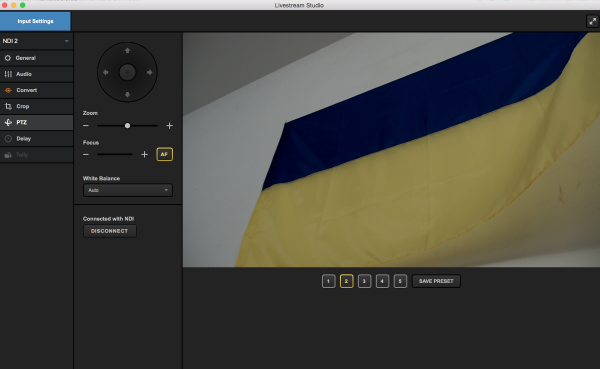 At this point, will see your camera's output appear in the Studio multi-view but you will not have control access yet. To the right of the PTZ source in Inputs, select the gearwheel. This will bring you to the camera's general settings. Select the PTZ tab on the left side. If you are connecting to your camera using VISCA, enter the camera's IP address. Port 5678 is standard but you may change it if you've configured your camera to communicate over a different port (1-65536). Adapter index is useful if you have more than one PTZ camera. Once you've configured your settings, select Connect. Alternatively, if your camera is communicating via NDI, navigate to the bottom of the menu where it says Connect with NDI. 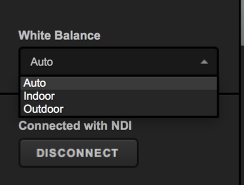 If an NDI signal is being received from this source, the Connect button will be enabled. Click it to activate the PTZ controls. After clicking either Connect button, your source will appear in the menu along side a set of controls along the left side of the pane. To pan and tilt your camera, click and drag the virtual joystick in the direction you wish to move the camera. 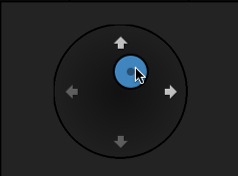 Below the virtual joystick is the zoom option; click and drag the zoom control right or left to zoom in or zoom out. Below the zoom control is the focus control. 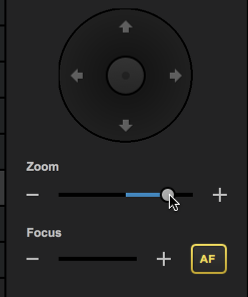 By default, the AF button is highlighted, which is Auto Focus. 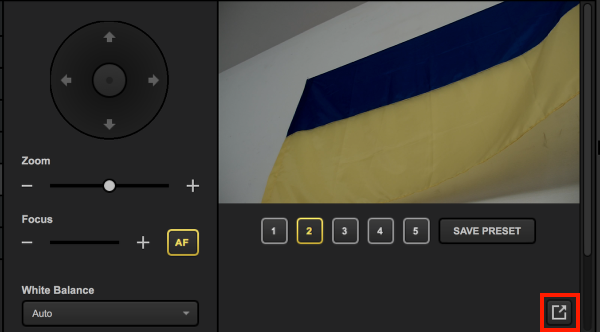 To control the focus manually, disable the auto focus and click and drag the focus control left or right to adjust it. Under the focus control is the white balance control, which is set to Auto by default. 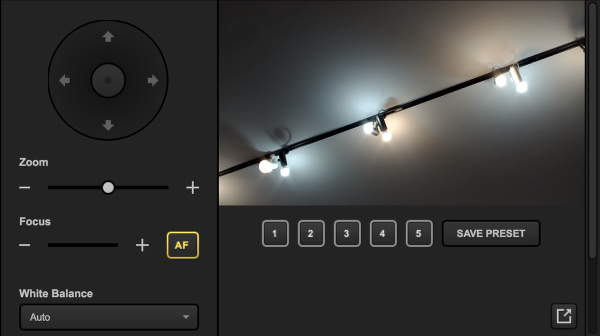 At the bottom, you can select Disconnect to disconnect Studio from your camera's PTZ controls. You can configure up to five preset shots if you know you need the camera to move from one shot to another frequently. 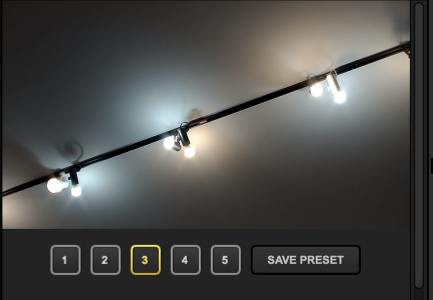 First, use the manual controls described above to get the shot you need, then click Save Preset. All the numbered buttons will turn green. Select the one you wish to use for this shot (in this example, we clicked 3). That number will turn yellow, indicating that you are currently on the number 3 preset shot. Now whenever you need that shot, click the assigned number and the camera will move to that shot. In the bottom right corner of the PTZ controller module, click the new window button. The PTZ menu will now be open in another window, which you can put next to Studio or in another monitor to control your camera outside of the main Studio interface. Can I Stream With an IP Camera?